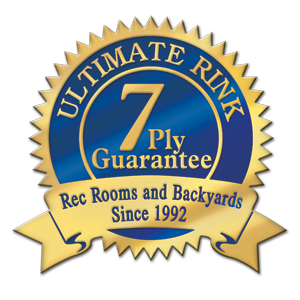 Here are several scenarios you may come across after or during your rink building process. Firstly if you can not walk on your rink then do not attempt. A step test is the best way of checking to see if you can walk on it. Start in the shallow area of you rink. If you can’t walk on it there then you can’t walk on it anywhere. Breaking through your surface and slicing your liner with an ice chunk is not conducive to success or your sanity. Just sayin! If snow is in the forecast and it has been mild with rain, best practice is to eliminate any snow that falls into the rain soaked surface ASAP as soon as you can. Big rinks are a little different to deal with due to sheer size. Simply put, best practice is to remove all slush and snow previous to any work you may do and do it previous to a refreeze. See below “weather fluctuations” for more info. If you can’t walk on it: With a snow blanket and slush this always poses a problem. If your rink box is filled with slush and a snow blanket it won’t freeze. You must do the following….. Remember, the reason why sled dogs sleep under the snow is because it does not freeze there. They won’t freeze and neither will your water turn to ice…..DO NOT WALK ON IT PERIOD!!!!!!!!! Drain or siphon off up to half the water at your discretion and with it, some of the melting snow. 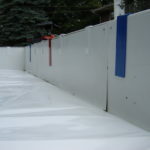 Then re fill your rink box with new fresh tap water which in turn will melt most of the snow. This will depend on how much snow you actually have however and how much warmer your tap water is. Now you have a new starting point and a new freezing will take place. 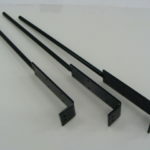 Do not try to shovel out your ice or snow accumulation due to the potential you will snag your liner and puncture it. This would be the worst case scenario next to walking on your surface and crashing through jamming your ice chunks into the liner and slicing it open. Monitoring the weather temps will be a good plan. You are wanting to do this when it starts to get cold to take advantage of the new weather front moving in and the freezing temps that come with it. Your tap water varies in temperature but in the city it could be 5-10 degrees therefore taking hours to fall to the proper temperatures for freezing. Firstly let’s just clarify that what we are about to discuss regarding the resurfacing of your lake rink, river rink or pond rink will be your decision and solely your decision and we take no responsibility for your actions to resurface your rink at any time or any place. The following is guidance based on ice that is 8″-12″ thick and based on weather conditions at the time of your flood resurfacing project that would support your travel to your ice rink site on pond, river or lake. Basic water supplies on ponds, rivers and lakes are usually from below the ice. This can create a problem. 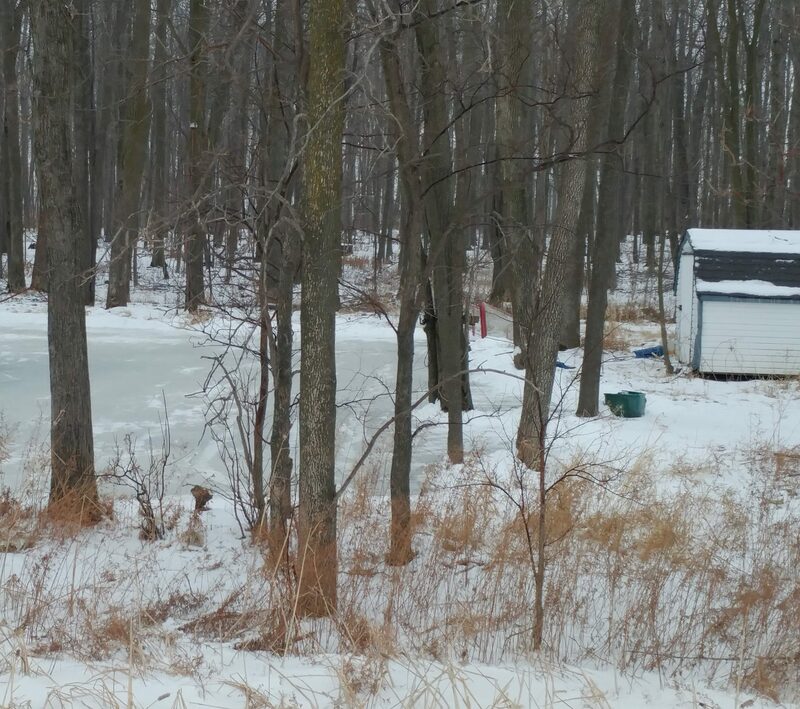 Warmer, fast moving water will create unstable conditions and you should not be building your rink in an area of this nature. But let’s assume your rink is situated in a safe quiet natural area. Resurfacing problems arise when the water temps below the ice are the same temps as the ice itself and those issues are qualified in the following text below. Air temperatures at single digit Fahrenheit or minus teen Centigrade is very very cold. When you flood/resurface with this very cold water pumped from below the ice, it sits on top of your ice rink surface and does not bond to the ice itself due to ultra cold temps. 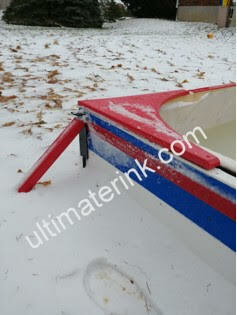 YES it will freeze but you need a bond to the existing ice surface to prevent shaling. Shaling is a separation of the new thin flood layer on top of the existing 8″-12″ thick ice. 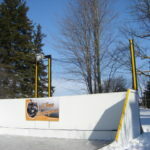 Shaling is caused by the skating action on your ice surface that has not bonded creating ruts and grooves and a dangerous skating surface that becomes a major problem. In our opinion, it is not worth resurfacing if the surface, after use, becomes dangerous. What do you do then? There are 2 solutions to this potential problem however. Keep Reading!! Solution 1. Wait till temps become mild if you are pumping your ice resurfacing water from below the skating surface. The cold water pumped from below will likely now bond to the existing ice surface. When the sun is shining the power to melt and warm is exceptional and the bond becomes real. 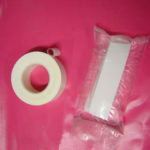 Solution 2. Use a hose and water supply from a well or from a tap in your cottage or home as most water drawn from below ground have temps above zero therefore allowing a natural bond to exist. Please note that if your are pumping water from the lake or river to the home and back to the rink this may not be ideal temps for proper ice resurfacing due to the fact they originally come from the ultra cold lake or river bottom. Summary: Regardless of your rink size the basic pond, river and lake resurfacing techniques are the same. 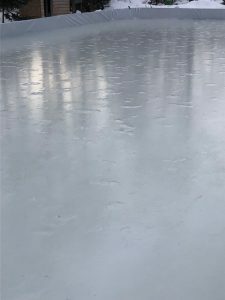 Air temperatures at single digit Fahrenheit or minus teen Centigrade is very cold and may not be conducive to successful ice rink resurfacing when using ultra cold water on ultra cold ice. The picture below features one of the most frequent repair jobs the average rink builder were come across. Simply stated…a bumpy surface most often caused during temperature fluctuations with wind playing a roll. Snow blown from the wind into wet surfaces accumulates and freezes in bumps as shown on Kindra’s rink.. NO FRUSTRATION is the goal here because it can be. Easy repair to your surface in a reasonably quick and painless time line is the goal. Let’s face it we’ve got better things to do. Yes you can bring out the torch (good for several small bumps) but as you can see that would take you a long time when it comes to helping out Kindra’s 40′ x 60′ ice surface. She stayed calm and we walked her through this process. It’s incredibly simple. Get your Ultimate Flooder out with your towel and do the “Hot Mop” (Kindra’s term) We have seen full blown, massive destruction of a rink surface and 3 “Hot Mop” floods taking over 30 minutes each had surface back on track. Kindra did 7 faster “Hot Mops” and below right side image was her perfect results. Good Luck and as always we are happy to hear of your families journey through winters exploring the world of your Ultimate Rink. Weather Fluctuations is what seems to be a current winter scenario. Here are the list of common “weather” in today’s winter in order of their arrival. These are what can cause havoc with your rink surface. Rain is the number one issue when followed by snow. Why? Because when the snow falls into the rain soaked surface you end up with freezing in a multitude of layers caused from windy conditions. This wind blowing the snow results in your surface variance in any number of inches side to side or end to end. Number 1 Solution is to remove all water from melt or rain before the snow falls into the rain accumulation. No rain accumulation on your ice surface means no snow to stick and no wind to blow snow into water causing havoc as mentioned in above paragraph. 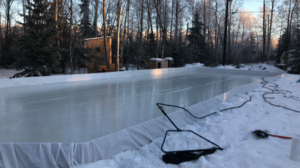 Small Rink Solution: shovel all weather off your rink before it freezes. Believe us it’s worth it. 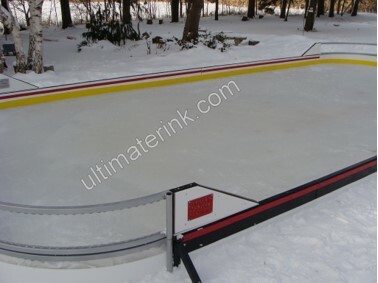 Large Rink Solution: Too large to shovel? Squee Gee all water off your rink and we will show you our new product and water clearing system that will allow you to do this. Methodology will be shared here, with you, in the coming months.